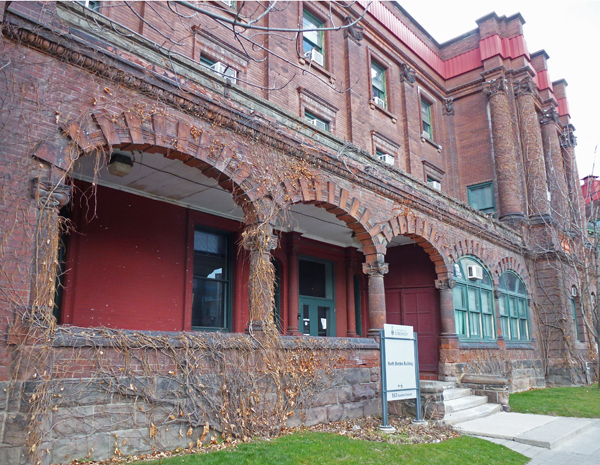 This building which is found on Spadina Ave just north of College St was built in 1900 as part of City Dairy which was owned by the Massey family. It was taken over by the University of Toronto (U of T) many years ago and is now called the North Borden building and houses various offices and centres of the university. It looks like it hasn't received a lot of TLC through the years and you can see where the two right-hand arches of the front porch have been filled in at some point. The columns on the building are wonderful and I will show you a close-up of some of the carving on them tomorrow. Hopefully this building will get some work done on it now that the new Architecture building has been completed across the road from it. I'll show it next week. ...let's hope that it doesn't become a high rise condo. Hello, it is a beautiful building. I hope it can be renovated and keep the beauty. Happy Thursday, enjoy your day and weekend! Cows on Spadina... awesome! I love history. Thanks for the lesson. What an interesting building. A little TLC could make this a real stand out. Fine looking Romanesque architecture. The ivy growing up the build does not help it either. At least the building has been put to good use. I don't know from what kind or architecture, but you know how much I love stone buildings. Whatever needs to be done should be done asap. This is a real treasure for the university and the city! A nice upgrade and this building will shine. I really like it and it serves a wonderful institution. Toronto is obviously thriving! Lots of good stuff going on. Glad they are saving these beautiful buildings. Those vines need to be removed before too much damage is done by them. Neat building, I hope it get the love it needs too. Cities need to preserve their heritage buildings. It certainly is worthy to survive, and be preserved for years!